When marine scientist Peter Ridd suspected something was wrong with photographs being used to highlight the rapid decline of the Great Barrier Reef, he did what good scientists are supposed to do: he sent a team to check the facts. His crime was to encourage questioning of two of the nation’s leading reef institutions, the Centre of Excellence for Coral Studies and the Great Barrier Reef Marine Park Authority, on whether they knew that photographs they had published and claimed to show long-term collapse of reef health could be misleading and wrong. “These photographs are a big deal as they are plastered right across the internet and used very widely to claim damage,” Professor Ridd told The Weekend Australian. The Stone Island reef in decline in 1994. Stone Island reef in decline in 2012. The Stone Island reef appears healthy again in 2015. Professor Ridd said it was only possible to guess within a kilometre or two where the original photograph was taken and it would not be unusual to find great coral in one spot and nothing a kilometre away, as his researchers had done. Nor was it possible to say what had killed the coral in the 1994 picture. A GBRMPA spokesman said last night “the historical photos serve to demonstrate the vulnerability of nearshore coral reefs, rather than a specific cause for their decline. “Ongoing monitoring shows coral growth in some locations, however this doesn’t detract from the bigger picture, which shows shallow inshore areas of the Great Barrier Reef south of Port Douglas have clearly degraded over a period of decades.” Centre of Excellence for Coral Studies chairman Terry Hughes did not respond to questions from The Weekend Australian. Professor Ridd was disciplined for breaching principle 1 of JCU’s code of conduct by “not displaying responsibility in respecting the reputations of other colleagues”. He has been told that if he does it again he may be found guilty of ­serious misconduct. About a quarter of the Great Barrier Reef has died and could take years to rebuild. The damage is concentrated in the northern section off Cape York. The scientific response to the bleaching has exposed a rift ­between GBRMPA and the JCU’s Coral Bleaching Taskforce led by Professor Hughes over how bleaching data should be treated and presented to the public. Conservation groups have run hard on the issue, with graphic ­images of dying corals. All sides of politics have responded with ­increased funding to reduce sediment flow and to combat crown of thorns starfish. University of Western Australia marine biologist Carlos Duarte argued in BioScience last year that bias contributed to “perpetuating the perception of ocean calamities in the absence of robust evidence”. A paper published this year claimed scientific journals had exaggerated bad news on ocean acidification and played down the doubts. Former GBRMPA chairman Ian McPhail accused activists of “exaggerating the impact of coral bleaching for political and financial gain”. Dr McPhail told The Weekend Australian it “seems that there is a group of researchers who begin with the premise that all is disaster”. Thank you for rescuing this from behind the paywall. I can't see any 'pingback' comment on your site (thought I haven't looked *very* long), so I thought I would let you know I have linked to this post. Cheers! Government estimate - £300 to £400 billion by 2050, that is £16000 to £20000 per household. Remember when our leaders told us they were certain that Saddam Hussein had weapons of mass destruction? They are the same people who now say CO2 emissions will cause catastrophic weather. Politicians tell us what they want us to believe. "Global warming" could be the most costly scare story in the history of man. It is hysterical alarm built on exaggeration and deceit, fuelled by those with a vested interest. Please use the search facility at the top left of the site to find specific articles among over 4300 on the site. Some suggested key topics: clouds, biofuels, hurricanes, windpower, global cooling, emissions, arctic, antarctic, zero carbon, stars, aussies, china, sun, Gore, schools, IPCC, NIPCC, climate models, hockey stick, trust in science. 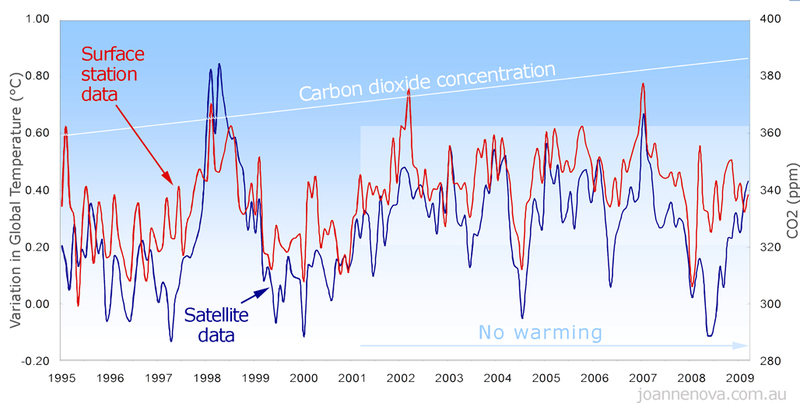 Below are two irrefutable arguments that should be top of any climate sceptic's list. Here's my choice for the best lecture on why Western governments are wrong on both the science and the policy on climate change. shows how our vast national debt is dragging the UK down. And this is before we take into account the burden of huge increases in energy costs in a hopeless attempt to control the climate. Here's another gloomy look at the UK economy. Are we really doomed? To oppose Emission Trading etc sign here. Click here for a selection. Here for The Great Global Warming Swindle. Where to begin? Here is an excellent summary. I also recommend David Archibald's clear articles which simply set out the information. Also read Joanne Nova's excellent Global Warming Skeptics Handbook. At just 16 pages it summarises all the main arguments clearly and concisely. 150,000 copies printed in the USA. Also read why the IPCC are wrong. and CO2 does not cause a problem. Finally for a full understanding read the latest nipcc report. Sign HERE for common sense on climate. You can see the massive propaganda behind the "global warming" theory, so please stand up and be counted! I have a BSc Honours degree in Applied Chemistry. After working in detergent research for a short while I then spent 17 years teaching science. Following that I ran my own successful property company with my wife Andrea. I am currently a New Forest District Councillor. I was involved in the campaign to try to keep Al Gore's political propaganda film out of English schools. I have three grown up sons and six grandchildren. Three have now left school while the others are currently (2017) aged 1,7 and 9. I see them regularly and take a great interest in their education.